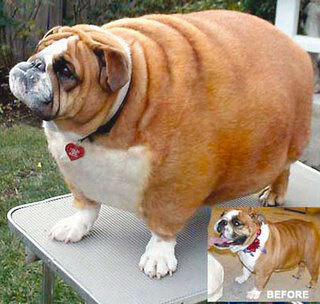 You are currently browsing the The Pet Product Guru blog archives for June, 2013. 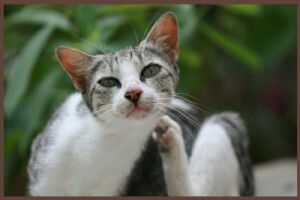 Several years ago, while vacationing in Delaware, I noticed that my two cats were scratching more than usual, even though they had their flea collars on. I then checked with my vet and he gave me drops to place on each cat. He told me to put the drops on their neck touching the skin. I did as he suggested. The scratching stopped but awhile later, while I was brushing my older cat, Molly, I noticed a bald spot around the area where I placed the drops. I checked it several times and it didn’t get worse. I checked with my vet and he said that Molly could have had an allergic reaction to the drops. My younger cat, Millie did not have any problem. Some cats may be allergic to these drops. If you notice anything unusual around the area where you placed the drops, check with your vet. The music plays all the time on THE EDGEWATER INTERNET RADIO NETWORK! We are a very mobile society. We are taking our pets with us more and more these days. Safety is an important issue when transporting your pet. Let’s say you’re driving 35 miles an hour with a loose 60 pound dog in your car. If you stop suddenly or crash, that dog can have the impact of 2,700 pounds. More alarming facts are posted on Bark Buckle up.com Loose pets are in danger of getting hurt during an accident. They also can cause an accident by distracting their owners. The best way to transport your pet is in a padded carrier fastened with a seat belt or restraining device in the back seat. 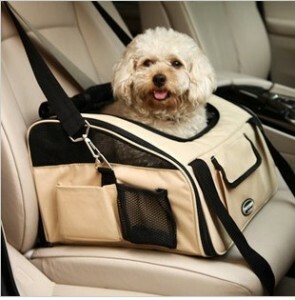 Strapping in the pet carrier prevents it from being thrown during an accident. Pet seat belts are not as effective as a carrier but they are better than having the pet loose in the car. If you choose to use a seatbelt, make sure it’s padded and can adjust to your pet’s size. Test the seatbelt on your pet before you buy it. The latches should be metal rather than plastic and they should be secure. Pets are safer in the back seat of a car. No matter which restraint you use, place your pet in the back seat. Never let your pet ride in front of an airbag. Have a happy summer with your pet. Listen to our six great radio stations featuring, oldies, country, dance, soft rock, standards and seventies. THE EDGEWATER INTERNET RADIO NETWORK! We’ve been blogging about pets now for about five years but costs are getting expensive. In order for us to keep our blog going, we need some help from you. A small donation via Paypal will help defray the cost of equipment, maintenance, and ISP charges. Please help us out today! It will be greatly appreciated! Thank you so much for your support. It’s very important that we provide a nutritious diet for our feline friends. You’re doing your cat a great injustice if you select the cheapest brand of cat food whether it be canned or dried. Cats need hydration and should have some wet food in their diet. I give my cats a small amount of wet food and a cup of dry food each per day. When shopping for high quality cat food, always look at the ingredients on the back of the bag. Cats of all ages need high levels of protein in their diet. They also need certain amino acids such as taurine and arginine, and fatty acids such as arachidonic acid and linoleic acid. Cats also require preformed vitamin A. This is present only in food of animal origin.It may be listed in cat foods as retinyl palmitate or acetate. The food must list a high quality protein such as meat, fist or egg as its first ingredient. These proteins are more digestible and complete than those of vegetables. Take your time, compare ingredients and make the right choice. Our six great internet radio stations are perfect at work. Check out the EDGEWATER INTERNET RADIO NETWORK! We want to continue providing you with information and tips on how to care for our furry friends and we can’t do that without your help! The cost of maintaining a web site, material and ISP is very expensive. If you can, please send us a small donation via Paypal. We certainly would appreciate your help and will continue to provide you with interesting tips and stories about our best friends. I once owned a sweet, little Chihuahua but I was younger at the time and was more interested in my social life than my dogs. The fact of the matter is that I did not socialize him. This resulted in a little dog who was afraid of people and other dogs. He would try to nip at anyone who would come into my home. This was very difficult when friends and family visited. He would violently bark at the gas station attendant every time I would stop for gas. He was afraid of other dogs when I would take him to the park. This was not the dogs fault but it was my fault. I wish I could do it over. Now that my dog is gone, I sometimes look back and reflect on ways that I could have made his life better. I learned a lot since then. All dogs should be socialized, especially at an early age, get your dog out into the world and expose him to as many things as possible: children, adults, sights, sounds, places and other dogs. One important thing to remember is that it’s not enough for your dog to see these things but your dog should have positive experiences with each and every one of them. 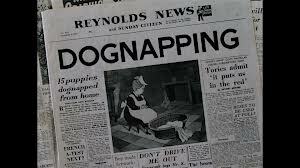 As I described earlier,lack of socialization can cause behavior issues for any type of dog. Also, don’t forget to spend lots of quality time with him. Keep the music playing all summer long! Listen to THE EDGEWATER INTERNET RADIO NETWORK for great radio and music! Certain plants are toxic to cats. 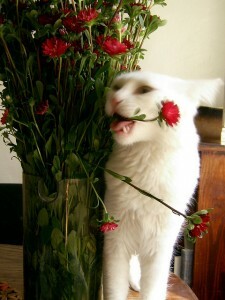 You should be not only be concerned if your cat is an outdoor cat but should also keep in mind that indoor cats can nibble on fresh cut flowers. Here is a list of plants that are toxic to cats some more than others. Azalea – Azaleas can have serious effects on pets. Eating even a few leaves can result in vomiting, diarrhea and excessive drooling; without immediate veterinary attention, the pet could fall into a coma and possibly die. Cyclamen– The roots of this seasonal flowering plant are especially dangerous to pets. If ingested, cyclamen can cause severe vomiting and even death. Kalanchoe– This popular flowering succulent plant can cause vomiting, diarrhea and heart arrhythmias if ingested by pets. Lilies – he more dangerous, potentially fatal lilies are true lilies, and these include Tiger, Day, Asiatic, Easter and Japanese Show lilies – all of which are highly toxic to cats! Even small ingestions (such as 2-3 petals or leaves) can result in severe kidney failure. Oleander – If ingested, the leaves can slow the heart rate, cause severe vomiting and possible death. Dieffencachia – Popular in many homes and offices, dieffenbachia can cause intense oral irritation, drooling, nausea, vomiting and difficulty swallowing if ingested. Daffodils– Ingestion can cause severe vomiting, diarrhea, abdominal pain, and even possible cardiac arrhythmias or respiratory depression. Lily of the Valley – These symptoms include vomiting, diarrhea, a drop in heart rate, severe cardiac arrhythmias, and possibly seizures. Pets with any known exposure to this plant should be examined and evaluated by a veterinarian and treated symptomatically. Sago Palm – . If ingested, the leaves and seeds can cause vomiting, bloody stools, damage to the stomach lining, severe liver failure and, in some cases, death. Tulips and Hyacinths – The toxic principle of these plants is very concentrated in the bulbs (versus the leaf or flower), so make sure your dog isn’t digging up the bulbs in the garden. When the plant parts or bulbs are chewed or ingested, it can result in tissue irritation to the mouth and esophagus. Typical signs include profuse drooling, vomiting, or even diarrhea, depending on the amount consumed. Information obtained from the Poison Pet Helpline website. Keep the music flowing this summer with THE EDGEWATER INTERNET RADIO NETWORK! Cushing’s disease is a chronically debilitating hormone imbalance that can affect many species, humans included. This disease results from excessive cortisol in the bloodstream. The symptoms are a result from a long term over-exposure to this hormone. In Dogs, there are many signs to look for, The signs come on slowly and because of it’s gradual onset, the symptoms are written off as part of the aging process. Here are some symtoms that you should be aware of and report to your veterinarian. You’ll first notice that the water bowl must be filled more frequently than in the past. Some dogs can’t hold their bladder in the night and start crying to go outside. All of these symptoms should be reported to your vet right away and he will give your dog the proper exam and recommend the best treatment. Listen the THE EDGEWATER INTERNET RADIO NETWORK for the best music! Lately, my younger cat Millie has been a cry baby. She meows for everything and sometimes just walks around the house and meows! She meows when it’s time for me to get up in the morning, she meows when she wants her snacks, she meows when she want to go out on the terrace and “help” me water the plants, she meows when she wants me to turn on the faucet so she can take a drink. (yes she does that too!) As you can see, I cater to her every need. Meowing is reserved for cats communications with people. They make different sounds such as yowling, hissing or growling to communicate with each other. 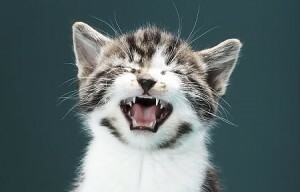 The amount of meowing varies by breed and even by cat. Oriental breeds, especially Siamese cats, are known as great “talkers,” so anyone who doesn’t like meowing probably should steer clear of these breeds. Some cats just seem to like to hear their own voices, while others seem to want to carry on a conversation with their owners. If your cat is talking a little more than you’d like, try to figure out the cause first. Once you know the reason, you can then work to get your cat to meow less or you can spoil her like I do and cater to her every need! Want great radio? Give THE EDGEWATER INTERNET RADIO NETWORK a try. It’s free and will keep you entertained all day! Music can be very useful in cases of separation anxiety. Put on music about twenty minutes before you leave. 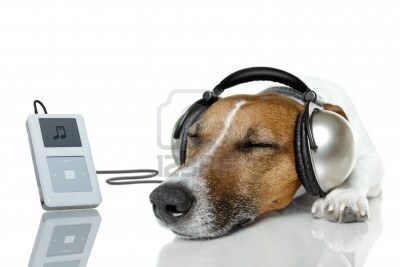 This gives your dog time to soak in the musical rhythms and hopefully make him feel calm and content. Music sure that the volume is low but low enough to mask external sounds. Once your dog is relaxed, leave for a very short time, two or three minutes at first. Leave quietly and don’t make any fuss. You want your dog to remain peaceful and quiet. The music should keep your dog calm for that period of time. You can now gradually increase the time that you’re gone but continue to keep the music on. If you are playing a CD, make sure the music is beautiful and peaceful. Put it on repeat an don’t worry about your dog getting bored with it. Hopefully,over time, you should see an improvement in his separation anxiety. Have your dog listen to STARLITE 365 on the EDGEWATER INTERNET RADIO NETWORK! Oh by the way, you can listen along with him! This is a story about a young man who owned a dog. The man was in the military and left for his tour in Afghanistan. During his time over there, the dog was taken care of by the man’s girlfriend. When than man’s tour was completed, he returned home to his loving pet who did not leave his side. The problem now is that the dog gets very stressed every time the man leaves the house, even if it’s just for a short period of time. He messes things up, jumps, barks etc. It’s very clear that this dog is suffering from separation anxiety. 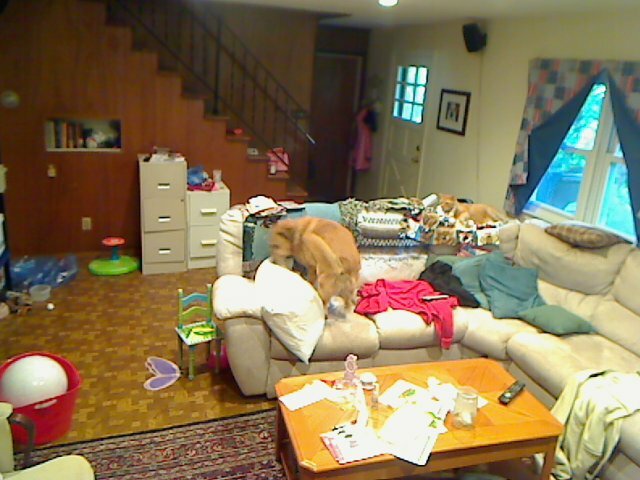 Every time his owner leaves the house, the dog feels that he will not return. The following information was obtained from the ASPCA website. This is stuffed with something really tasty, like low-fat cream cheese, Cheez Whiz® or low-fat peanut butter, frozen banana and cottage cheese, or canned dog food and kibble. A KONG can even be frozen so that getting all the food out takes even more of your dog’s time. Try giving your dog a Kong when you leave the house for over a half hour or so, see what happens. Most likely, your dog may want you to go out more often! Moderate or severe cases of separation anxiety must be dealt with differently. These cases require more complex desensitization. It crucial that your dog gradually becomes accustomed to being separated from you by starting with many short separation experiences that do not produce anxiety. Then gradually increase the duration of separation time over many weeks of daily sessions. We will write more on this subject in the coming weeks as the various situations can be complicated. If you love ,music, check out THE EDGEWATER INTERNET RADIO NETWORK – music, news and weather to keep you going all day long! You have an emergency have to leave your dog tied to a pole for just a moment but when you come out, your dog is gone! You are devastated and confused, you panic, what should you do first? You can go to the police and file a report but to tell you the truth, it won’t be their first priority. Become your own private detective and go to shelters and put up posters in your area. Start off with a three mile radius. Wait a few days and if you can’t locate your dog in five days, expand the radius to 50 miles. Keep going out. Go up to a 100- mile radius because it’s possible to recover a dog from 100 miles away. Some people will give up after a couple of weeks but some people actually find their dog a year later.So don’t give up. Keep asking around and stay determined! If you are a real animal lover, then refuse to buy cut-price dogs without the right paperwork or adequate background checks. Unfortunately, people buy stolen dogs. IF you can’t afford a dog, please don’t buy a stolen dog. Do your research, get the proper paperwork. 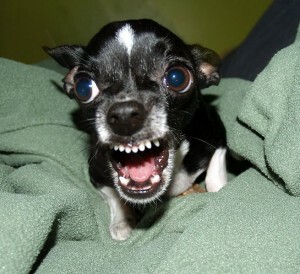 Have your dog micro chipped and do not let him out of your sight! If you like music, you’ll love THE EDGEWATER INTERNET RADIO NETWORK!